There are many things anyone considering memory care for a loved one should know. In our last blog, we went over the early warning signs of dementia and stressed the importance of getting prompt care as early as possible in the disease. Although therapies and medications have been used to treat dementia successfully, many people who suffer from it also require 24-hour care and supervision to keep them safe, which leads many families to memory care. #1. Memory care is not the most affordable option. When it comes to the many forms of senior care, costs can vary wildly from an average of $71 a day for Adult Day Health Care to a whopping $227 average per day for skilled nursing facilities. And, unfortunately, memory care is one of the more expensive options. However, there’s a very good reason for the increase in cost, and it comes down to the higher level of care and support provided in memory care facilities. Additionally, memory care facilities themselves have to be kept more secure with the right technology to prevent residents from wandering off and getting lost, and that adds to the cost. Furthermore, memory care communities have a higher staff to patient ratio. #2. A locked unit does not mean a secluded unit. As we mentioned in our last point, memory care units are typically locked or secured, which often means that a certain code needs to be entered to unlock the door, or it might be necessary to scan a badge or another device. This is absolutely essential for the safety for the residents inside, who are prone to forgetting where they are or getting lost. However, a secure community does not mean a secluded community. In fact, these communities typically do everything they can to create a comfortable, home-like environment for their residents, and they’ll keep residents engaged and connected through activities and other programs. #3. Memory care can improve your loved one’s quality of life. #4. Memory care is for families and loved ones, too. When most people think of memory care, they think of the many ways that it can benefit people suffering from dementia, which is certainly the most important thing to think about. But, the benefits of memory care extend far beyond the individual receiving the care; it can also be invaluable to the families and other loves ones of those individuals. The fact that you know that your loved one is being cared for, and that they are somewhere safe and secure, is a huge benefit on its own, helping to ease concerns and providing peace of mind. But, some memory care facilities go even further by providing outreach to families and loved ones of those suffering from dementia. This helps people close to those suffering from dementia to learn how to best overcome the challenges associated with the disease. #5. Memory care is aimed at more than physical safety. Many of the points we’ve gone over in this blog have to do with the physical safety of your loved one, like how memory care helps to prevent them from wandering off or overdosing on their medication. However, memory care does so much more than keep your loved one safe on a physical level. Many memory care programs offer therapies and other treatments aimed at addressing the common behaviors associated with dementia. It’s because of these treatments that memory care communities report that half to three-fourths of their populations are either able to maintain their current level of mental functioning or are able to actually improve it! #6. Memory care is not the only option after a dementia diagnosis. When a loved one is diagnosed with dementia, it’s easy to assume that memory care is the best option for their needs, but that’s not always the case. Every individual is different and has their own unique needs, and the best option for another person in a similar situation is not necessarily the best option for your loved one. Memory care is not the only senior care option out there that can be suited for someone suffering from dementia, particularly if your loved one is in the earlier stages of the disease and does not require the high level of care provided in memory care facilities. If you’re unsure about whether memory care or another senior care option is ideal for your loved one, contact the Senior Living Consultants at A Right Place for Seniors. We specialize in helping people just like you find the right solution for your needs. #7. Not every memory care community is made equal. Entrusting your loved one’s safety and care to a facility or a community is not such an easy thing, and it’s also not something you should take lightly. We would love to be able to tell you that every memory care facility can provide your loved one with the high level of care that they deserve, but that’s just not the case. There are many different memory care communities out there, and some of them provide better care than others. When it comes to memory care, it’s essential to do your due diligence and thoroughly research and vet the communities you’re interested in. Take the time necessary to learn about the facility’s policies, staff and programs, and always make it a point to visit in person so that you can see for yourself the kind of care that your loved one will receive. With A Right Place for Seniors, you don’t have to go through the process alone. Now that you know a little more about memory care, you can take the first step towards figuring out if it’s the right option for your loved one. And, luckily, you have A Right Place for Seniors on your side. 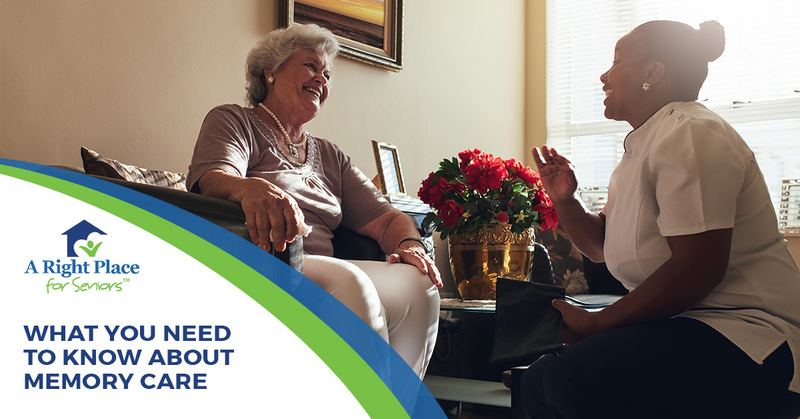 Our Senior Living Consultants have what it takes to help you determine which senior care option is right for your loved one, and from there, we can also help you find the facility, community or program that will best meet their needs. Take the uncertainty out of the process of finding the right care option for your loved one. Contact our Senior Living Consultants today.